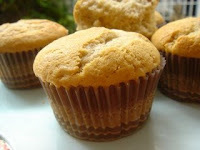 Make banana muffins with your rotten bananas! You are here: Home / Avoid food waste / Make banana muffins with your rotten bananas! Don’t throw out your old bananas! You can freeze them to make smoothies with or make banana muffins with your rotten bananas! Preheat oven to 400F or 180C. Add dry ingredients together. Sift flour, sugar, baking powder, and salt together. Mix the eggs, bananas, and butter; add to dry ingredients, stirring only until the all ingredients are combined. Spoon into well-greased muffin tins. Bake for 20 minutes. I usually touch the top of the muffin to see if it is ready. If it is it will spring back. You can add choc chips, walnuts, or coconut to the mixture. I like throwing nuts on the top for decoration. You can use other fruits besides the bananas but they may not have as much liquid and you will have to add a bit of milk to compensate. Does Installing Solar Power Panels Really Save You Money?